Case: Having designed and built the mold for PSU, designed built for thermal expansion, etc is there an alternate resin any of you have known a mold to debug with that would not require the high heats, braided hoses or oil? I'm contemplating using PC. The goal of this debug is to validate mold mechanics and the make sure all functions correctly before going to the specified resin and services (oil). If all you are interested in is if the mechanics work, then dry cycling without plastic will tell you that. If you are looking for something more such as obvious mismatch, venting, gate function, fill problems, etc. Then PC is a pretty good choice if run with cooling temps near the top end of what is available with water cooling, that is 195 - 200°F. 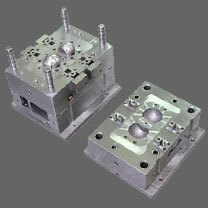 PC molding behavior is similar to PSU especially in the low MFI grades. I do want to re-iterate the caution that if you do not test the mold at the intended run temperatures, you run the risk of seizing the mechanical aspects of the mold when you do run it hot.